I won this book through GoodReads First Read program. This is actual the second edition.I am an attorney and a right wing conservative so I began this book with apprehension thinking it would be a left-wing attack on the Supreme Court's decision in 2010 of Citizen United v. FEC. Even though there were some things I disagreed with I thought Clements' argument was pretty convincing. My thoughts at first were "What about Unions? They have the same opportunities as corporations." Clements addresses this.I was also intrigued by Justice Lewis Powell's involvement in the eventual change to a corporation having a voice. His involvement with the cigarette industry was something I was unaware of. Even though I am anti-big government the cigarette industry is a good example of why government needed to get involved.I wish Clements gave more information on the other Justices who voted with the majority. He gives early Rehnquist quotes about a corporation not having a voice yet never discusses why he later agreed with Powell and the majority. Also even though it is stated it is done so in an off-hand way, the decision did not allow corporations to pour unlimited money to particular candidate's campaign. It merely allows them to do whatever advertising the corporation wants to regarding an issue or candidate. Finally, I think the problem is with our political representatives, not the corporations. We need term limits. That would go to prevent the buying of votes which take place. Advertising to me is overrated. I don't vote based on political campaign ads. Holding the voters responsible and those that they elect is not discussed. Merely that because corporations pour money into advertising to get their (those who run them) ideas across assumes that people have no independent thought and will vote based on the most advertising they see, not on what the content of the advertising is. Excellent! 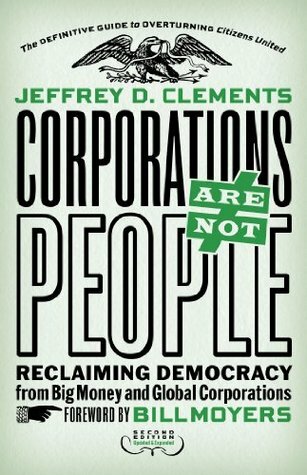 This is a must read for anyone who has any hope that democracy might prevail in the never ending battle with multinational corporations. It might even change the opinions of some on the right - then again I might be dreaming.